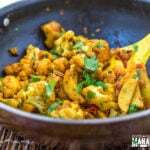 Simple Indian stir fry with potatoes and fresh fenugreek leaves. This Aloo Methi was quite a winter staple in my home and is best enjoyed with flatbread like roti. I don’t see fresh methi leaves (fenugreek) very often here in the market. But whenever I spot them, I make sure to buy few bunches and either make paratha with them or a simple stir fry like this Aloo Methi. Methi was cooked very frequently in our kitchen in India during winters. We didn’t get methi leaves in any other season, so as soon as winter would commence, methi would become a regular feature on our table. 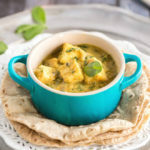 It was added to saag, to methi malai paneer but the most common way mom cooked methi was aloo methi. 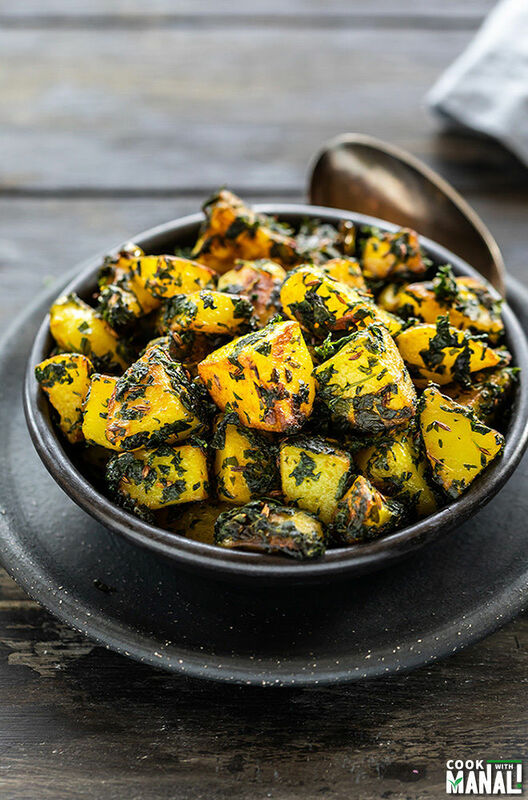 Potatoes go well with everything when it comes to Indian recipes and methi is no exception. It’s such a simple stir fry where most of the flavor is from the fresh fenugreek leaves. I have hardly added any spices to this sabzi. Personally, I love using mustard oil to cook aloo methi. It gives it such a unique taste and I highly recommend it. Of course, you may use any oil of choice but if you can, do use mustard oil. When cooking with mustard oil, always remember to heat it well before adding the tempering. 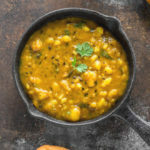 Mustard oil has a strong flavor and taste so if you don’t heat it up well initially, the end dish might be bitter. I always make sure it’s heated very well, them remove the pan from heat and then add the tadka (cumin seeds in this case) so that the ingredients for the tadka don’t burn in the hot oil. 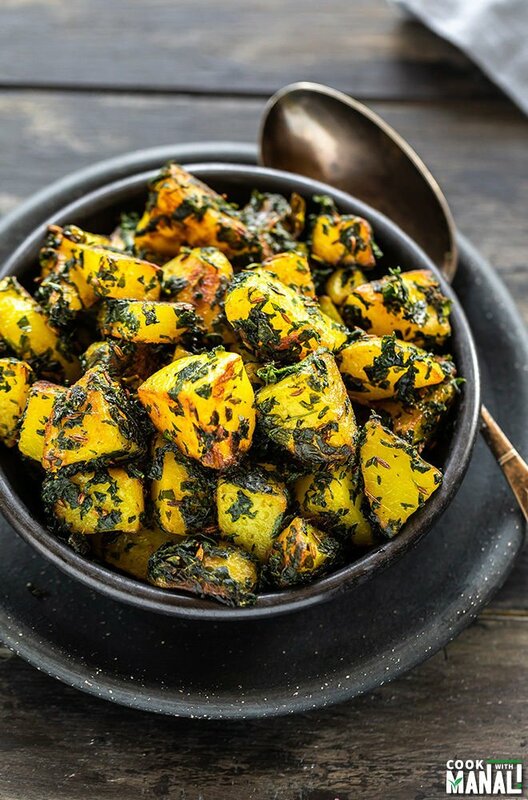 The best part about this aloo methi recipe is that it’s so basic. This is exactly how it was made in my home. In the name of spices, there’s only turmeric and cumin seeds and nothing else. You can obviously add ground spices to it like coriander powder, etc. but this is how I like it, super simple. When cooking potato with leafy greens, I tend to go very light on spices, just like in this aloo palak too. 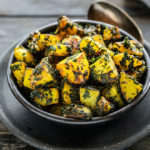 Methi is slightly bitter in taste so I don’t use a lot of it in this recipe since that’s how I like mine. However if you prefer more of the methi flavor in your aloo methi, feel free to double the quantity of methi leaves. 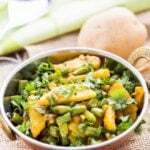 Enjoy this aloo methi with roti or paratha! 1- Heat 2 tablespoons of oil in a pan on medium heat. If using mustard oil, heat it well until its really hot and then lower the heat before adding the cumin seeds. Add cumin seeds, let them sizzle for few seconds and then add the garlic. Saute for few seconds until the garlic starts to change color. 2- Then add the chopped potato and green chili. Stir. You may also add chopped onion at this point. Fry the potatoes in oil for 5 to 6 minutes until slightly golden brown. Toss them once or twice in between. 3- Add the chopped methi leaves, turmeric and salt and stir. Cook for 6 to 7 minutes (keep stirring in between) until the leaves are cooked, the moisture dries out and the potatoes are done. I have not added any water here but you may sprinkle some water and cover the pan with a lid to cook the potatoes faster. 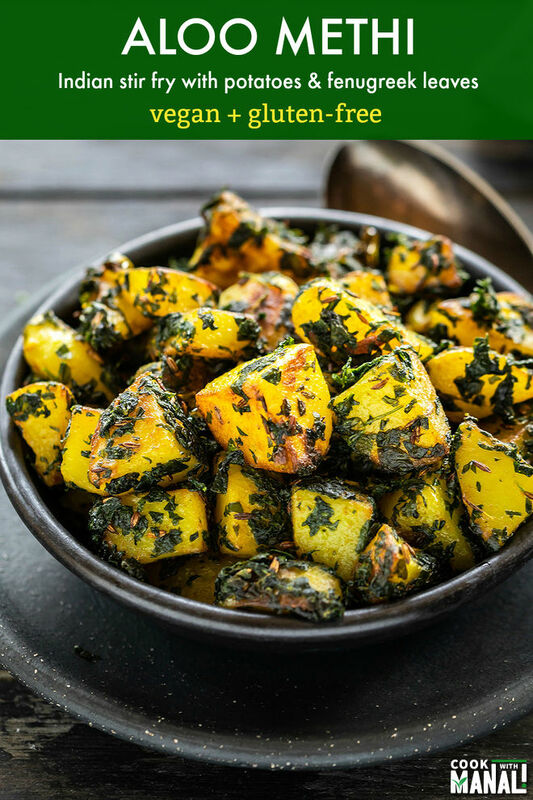 Serve aloo methi with roti or any bread of choice. 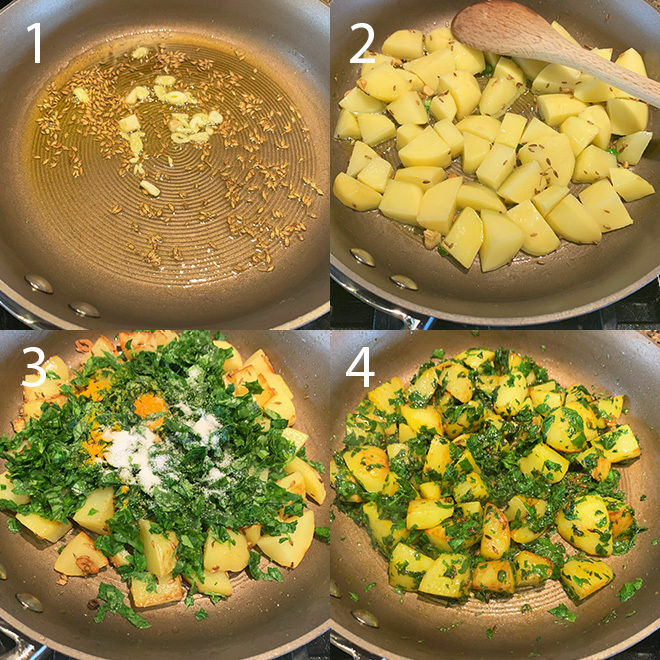 If you’ve tried this Aloo Methi Recipe then don’t forget to rate the recipe! You can also follow me on Facebook and Instagram to see what’s latest in my kitchen! 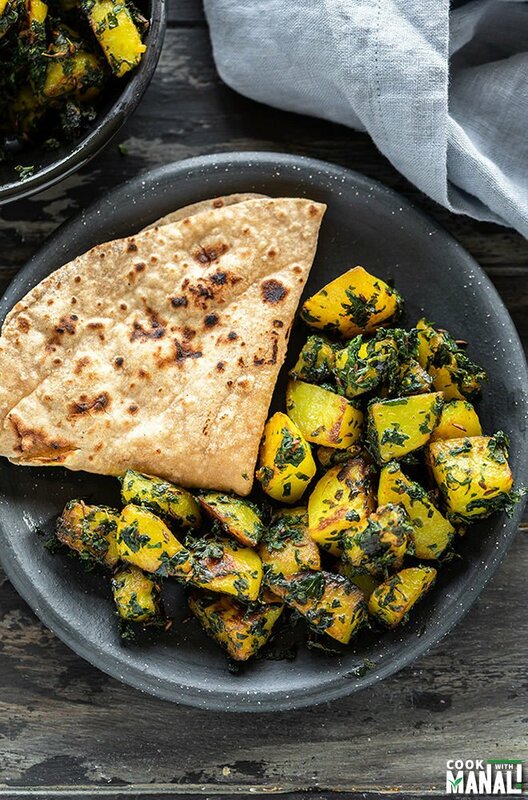 Simple stir fry made with potatoes and fresh fenugreek leaves, this Aloo Methi is lightly spiced and best enjoyed with flatbread like roti or paratha! Vegan. Heat 2 tablespoons of oil in a pan on medium heat. If using mustard oil, heat it well until its really hot and then lower the heat before adding the cumin seeds. Then add the chopped potato and green chili. Stir. You may also add chopped onion at this point. Add the chopped methi leaves, turmeric and salt and stir. Cook for 6 to 7 minutes (keep stirring in between) until the leaves are cooked, the moisture dries out and the potatoes are done. I have not added any water here but you may sprinkle some water and cover the pan with a lid to cook the potatoes faster. Double the quantity of methi leaves for stronger methi flavor.